Think of the grain, or the collection of muscle fibers in a piece of meat and the direction they run, as similar to the grain that runs through a wood cutting board: The lines that indicate grain are visually apparent on both. 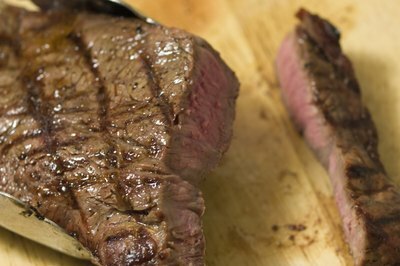 You can cut any meat across the grain, but the cuts that need to be sliced against the grain for tenderness include any beef cut from the chuck, rump, brisket, short plate and flank. On pork, you can safely assume every cut benefits from slicing across the grain. Let the meat rest on a plate, loosely covered in foil, for about 5 minutes per pound after it finishes cooking. Transfer the meat to a cutting board and examine it for thread-like ridges; on some cuts, such as rump roast, these ridges, or grains, run the length of the roast. 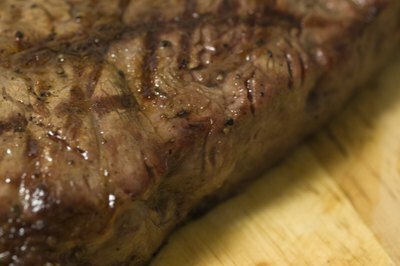 On other cuts, such as flank steak and skirt steak, the grains run the length of the cut, usually at a slight angle. 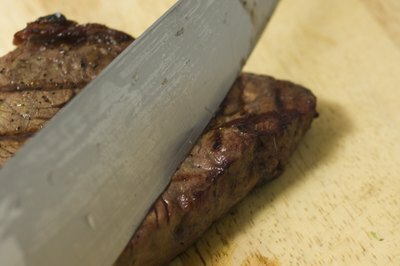 Press the meat to the cutting board gently with your fingers, just enough to keep it from slipping when you slice; hold large cuts in place with a carving fork. Position the knife across the grain and about 1/4 to 1/2 inch inward from the end of the cut; slowly pull the knife towards you for the length of the blade. You can slice small cuts, such as flank steak, with one broad slice; large, wide roasts need a gentle sawing motion consisting of broad slices. For each subsequent slice, position the knife 1/4 to 1/2 inch further inward and repeat. If the meat has a bone in it, simply cut around it.